The casual observer may mistake them for a panicked stampede of white sheep rushing over a cliff. A few black sheep hang out by the sidelines, unsure of what to do. We don’t want to be left alone, yet we haven’t yet found a partner that inspires us to madly sprint into an abyss. Afterall, we’ve been preoccupied, content doing our own Black Sheep things, not concerned with the rest of the world. Until now-when the world becomes concerned about us. I neglected to tell him that I had already outlived my predicted dating app mortality and still appeared to be breathing. Unfortunately, my friends weren’t sure how long I’d survive in my negligent state without life support. One set of married friends invited me over for lasagna last Sunday. They took pride in feeding the less fortunate: the 6th street homeless in the morning and the singletons at night. Taylor Swift’s “I Knew You Were Trouble” played from the speakers, luring me into an oval room where six women perched on wooden stools, their perfectly cut diamonds catching the last rays of sunshine before dusk. The music abruptly stopped and I realized there were no stools left. I was the only one standing, last in the game of musical chairs. Each person represented a different self help book, doling out advice on how I could ‘achieve the life I always dreamed of.’ But it wasn’t the life I dreamed of — it was just their life. I didn’t want to rush into a relationship just so I had a ‘plus one’ at dinner parties. Their words were a bullwhip, urging me off the marriage cliff. I was getting itchy in my black wool sweater. I went to the stereo, turned the music back on and left, leaving Musical Chairs for someone else. I didn’t want to sit down so badly that I’d choose the floor. I headed straight to the ‘Misfit Whisky Bar” to meet my friends Daniel and Derrick, self proclaimed ‘Special Snowflakes’, who had been drinking single malts there for seven years. Luckily there was still a stool left for me. “The problem is our parents,” said Daniel. “They loved us too much, so we didn’t need to seek it elsewhere. Their love affords us to be solo, reckless, and drink a lot of whisky. Derrick and Daniel may die in that bar, but they had a point. I’ve never felt more alone than when I’ve been with someone that wasn’t the right fit. Healthy relationships are an ongoing compact where two people commit to choosing each other every day. Without choosing or feeling chosen, your heart and digestive system become queasy. In one relationship, I was so nervous of NOT feeling continuously chosen, I couldn’t poop normally for six months. Was being in a relationship worth developing Irritable Bowel Syndrome? Women that anxiously try to “lock down a man” don’t just get the runs, they also make men run. Determined to never be one of these women, I convinced myself that a diamond ring would just weigh down my hand. I was destined for solo adventures. According to society, this was a clear sign of a genetic disorder. I promptly called my mother to complain. Could I reprogram my molecules to better fit into society’s fold? I was tired of pink-jacketed self help books from anonymous donors randomly appearing in my mailbox. Just as I went to pick up another Amazon delivery of the “The 5 Love Languages” one of my intervention friends called. The only way I’d be able to endure staying under a quilt with someone for that long is if I held out for a connected conversationalist. Picking a life partner is also picking your dining companion for the next million meals. I didn’t want to marry a monologist just because we both panicked in our 30s. Choosing to hold out is placing a bet. As any good gambler, I was aware of the odds, risk and possible payoff. But to me, remaining single wasn’t losing. ‘Losing’ was feeling pressured by society to deter from your own happiness quest and re-route on fear. 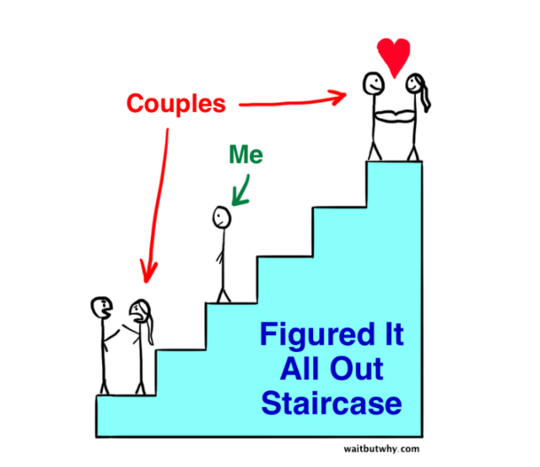 It’s hard to shake the feeling that everyone around you is in perfect relationships at the top of stairs while you’re relegated to straddling the middle battling alcohol poisoning. However, that’s just paranoia talking. Perfection is a mirage. Plus, I think each rung on the staircase has potential, especially when there are enough other black sheep to keep you company as you figure out your place. If being single is a choice then so is being happy. My good friend Plum once told me that once had an ephinany on her yoga mat where she decided to stop searching and start living. She let go of fear, excited about the prospect of single yoginihood. And then, bam, on the eve of her 40th birthday, her future husband appeared. If we can thrust off society’s pressure, and become happy where we are, unexpected magic has space to enter. An adventure, a new bourbon, or a summer blizzard full of other special snowflakes. The best stuff in life isn’t planned.